Home»Food»Not Your Grandmother’s Brewery: Opposition Brewing Is Down To Brass Tacks, Thankfully So! Not Your Grandmother’s Brewery: Opposition Brewing Is Down To Brass Tacks, Thankfully So! Here’s the thing about Opposition Brewing: it’s not for touristy types. If you’re looking for a nice sit-down place, for table service, a nice ambiance, or something quiet to have a conversation about the Shakespearean play you’ve just seen, this place is not for you. But if you want a bar to belly up to, talk to a bartender with an actual personality, meet some great people all while drinking some great beer, then Opposition is your spot. It was loud, and full of energy when I went. People from all walks of life filed in there, and they all seemed like one big family. The bartender calling people by name, and the patrons teasing one another like siblings. Their tap list housed seven beers, all of which Opposition’s own, and a single cider from Ace. Every beer name, an homage to the brewery’s original name: Apocalypse. Centered around end times. Game over. There’s the Tunguska Event, Blast Radius, and Sixth-Seal, just to name a few. A cleverly named, high abv., Nickabod Cranium Pumpkin Brown, named after the beer recipe creator, Nick of Osmo’s Brewery. Every beer flavor was unique, even the pale and the IPA were different. In a world where every brewery smothers their Pale’s with hops, I found myself appreciating Opposition’s more subtle approach. Their Tunguska Event Pale had a soft, slightly sweet front (I tasted Kiwi) with a nice mild hop finish. The kind of beer that is both refreshing and flavorful. My favorite, however, was the Devastated Sky American Stout. Served on Nitro. Pure elegance. Its chocolate nose acts as the precursor to the dry and yet robust flavor of baker’s chocolate. Smooth and easily drinkable. They had a couple of brown ales on tap that were delicious as well. Currently, they have a 1.5 barrel system. But they’ve started to expand. They’ve opened up the brewery into the neighboring unit, constructed a larger refrigerator, and purchased a 7.5 Barrel fermentation tank. Things are looking good for them. 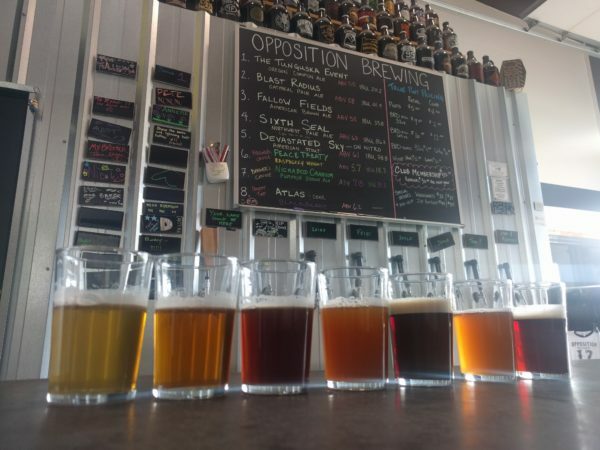 Opposition Brewing is a spot that doesn’t lack for character. This is not a brewery that’s been cut and trimmed from a cookie cutter model, like so many new breweries popping up. You won’t find the same beer tropes, they won’t use a table-tent advertisement for their new Summer Sangria nor will you get a server with a name tag and 35 items of “Flair.” It’s all brass tacks. No nonsense. Just the beer, ma’am, thank you very much.